It is time for another update in my "My Skin Loves" blog series. "My Skin Loves" is where I share my very favorite skincare products: my "Holy Grails" of skincare! :) This time, I am sharing an old favorite that has made its way back into my skincare routine! As you all may know, I have a bit of a love-affair with Kate Somerville's line of skincare products! With awards season, you often hear celebrities mentioning Kate Somerville. Using Kate Somerville skincare is one of Hollywood's best kept secrets about looking good for the red carpet! With the way that this particular product seems to "erase" wrinkles, I am not at all surprised by that fact! Seriously, this product literally smooths out my fine lines in minutes! There is absolutely nothing else that I have ever used that works quite like this product. I was first introduced to this product over a year ago when I was watching a QVC special with Kate Somerville. I watched Kate demonstrate Dermal Quench and I was completely amazed. You literally spray it on and as it absorbs it plumps your skin and smooths out your fine lines and wrinkles. It makes them almost dissapear! So, ya'll know that I just had to try it out! This product is an old favorite and I have recently come back to using it and can't believe that I ever stopped!!! As a beauty blogger, I am often rotating products and trying new things to review here on the blog. 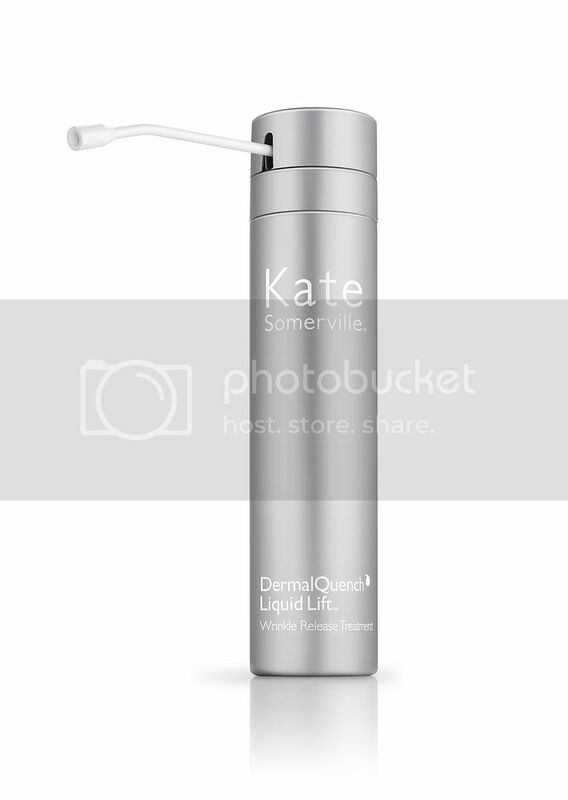 So, it is a major treat when I cycle back to a favorite product like Dermal Quench Liquid Lift from Kate Somerville! Honestly, I have never tried anything else quite like this product! The results are almost instantaneous and have such an amazing visual impact! You seriously just need to try it to believe it. It will erase or lessen your wrinkles just a few minutes after application. Now, you might be thinking "You don't have wrinkles Pammy!". Well, no, I really don't. However, I do have some fine lines around my eyes that look much more prominent when my skin is dehydrated. This unique Dermal Quench spray completely obliterates those. I often surprise people when they hear my age. I am 40 years old and honestly happy to report that I don't look it. When I first meet people at parties and get-tethers and they find out my age...they will often jokingly want to know my "secret" to looking young. This product is one of those secrets! I almost always use Dermal Quench before nights out and date night. :) A spray of Dermal Quench before applying makeup smooths out those fine lines beautifully for beautiful smooth skin on nights out! I have sensitive combination skin. I have that unique problem of skin that needs anti-aging components yet also can be prone to breaking out (if I am not careful in my product selection). While I do not have any major wrinkles (yet! ), I would like to take whatever action that I can to prevent them! 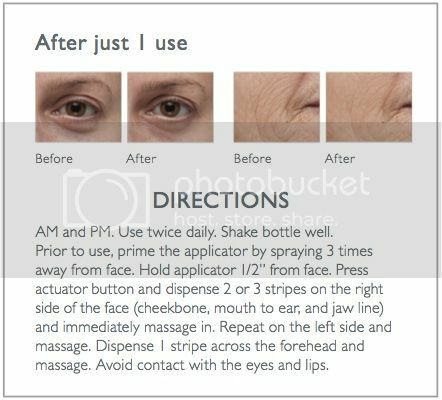 To find out more details about Kate Somerville's amazing DermalQuench Liquid Lift and how I use it, please keep reading! Kate Somerville's DermalQuench is a new breakthrough product that fights aging with technology that produces immediate and long-term results. This formula attacks visible signs of aging like wrinkles, sagging, uneven skin tone, and dryness. It plumps your skin like nothing else! They key seems to be the product's delivery system. It is able to instantly get that moisture into your skin to plump and hydrate. The product itself is quite curious and unique! DermalQuench comes packaged in an aerosol container with a long spout. You direct that spout along the application lines of the face while you spray: cheeks, jaw, mouth-to-ear, and forehead.What dispenses is an ultra-light and almost water-like clear liquid that you immediately rub in. It does not feel slippery nor greasy, just wet. It carries a slight lavender fragrance. The only downside to this product, for me, is the scent. I am not a huge fan of lavender. So, I would prefer if this product was unscented. However, the product is so amazing that I will deal with the scent. Now, if you are a fan of lavender, then you will love the scent! The 3 main components of the advanced HydraFillTM complex work together to increase volume, significantly smooth skin, and dramatically reduce the appearance of fine lines and wrinkles. PFC-Oxygen Carriers deliver an infusion of much-needed oxygen, designed to smooth, soften, and help superficial facial muscles to relax, while also working to rid the skin of impurities. Fast-penetrating Hyaluronic Acid - naturally abundant in youthful skin - produces deep, long-lasting hydration that improves the look of elasticity, firmness, and texture. Rare Botanical Extracts instantly increase the look of radiance to create a brighter complexion. I use DermalQuench almost exactly like the directions stated above. I find that this product is taking the place of "toner" in my skincare routine. I use it immediately after cleansing. It immediately tones and hydrates! Then, I top this product with whatever serum and moisturizer I am using. 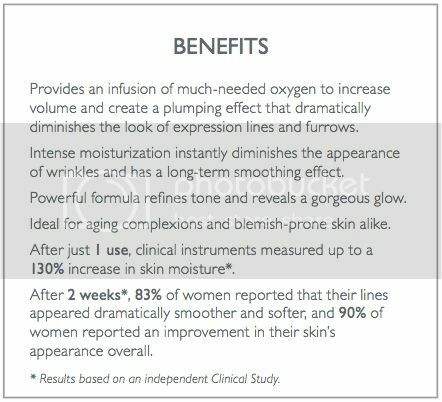 My serums and moisturizers tend to "seal in" the amazing benefits of this DermalQuench formula! This product has the ability to seemingly erase any expression lines on my face. Granted, my fine lines are not that noticeable overall. However, they are noticeable to me! I know...we are all our own worst critics, right? Well, after applying and rubbing in this product, I can't even *see* my expression lines! I am completely wow'ed!!! I can totally see why celebrities use this before walking the red carpet! It has such instant and noticeable effects on the skin! Seriously, I would bathe my entire body in this miracle product if I could. As it stands, since this product is pricey, I will likely "save" this product for use during the day so that the immediate results can be seen (instead of using before bed when I am just going to sleep). Are you a Kate Somerville skincare user and fan? I would love to hear about your favorites from this line. I am dying to explore Kate Somerville skincare further!!! Wow! It sounds great! You and I have the same type of skin. The only product I tried in the past by this brand was a serum, not meant for my breakout prone skin. I'd love to give this one a try! Thanks for the review. I love this product and try to use it as much as possible. However, I find the price point a bit high. Can you recommend a comparable yet more affordable product?